kind of a harry potter theme going on here.... trying to get back into this. but the rest i dig. meh' about the words tbh. not loving them as much as the drawing. not a huge fan of the color scheme either.... some parts are blended much better than others the left of his face i think the light/green is too defined.... and the top right the green is too hard imo.... but this is cool I've never done work on a pic like that i do like the whole concept though... keep it up my dude. 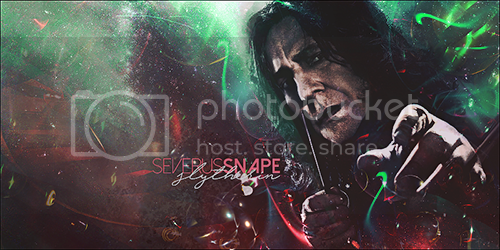 Professor Snape has always been a favorite character of mine the Potter-verse. Sick graphic, Pyrophorix.